The Gem & Jewellery Export Promotion Council (GJEPC) presented the trade with two wonderful opportunities to commence the Year’s buying season with the 12th edition of Signature IIJS and the 6th edition of India Gem & Jewellery Machinery Expo (IGJME) from 10-13 February 2019 at the National Exhibition Centre, Goregaon, Mumbai. Dr. Subodh Kumar Agarwal (Addn. Chief Secretary – Industry, Govt. 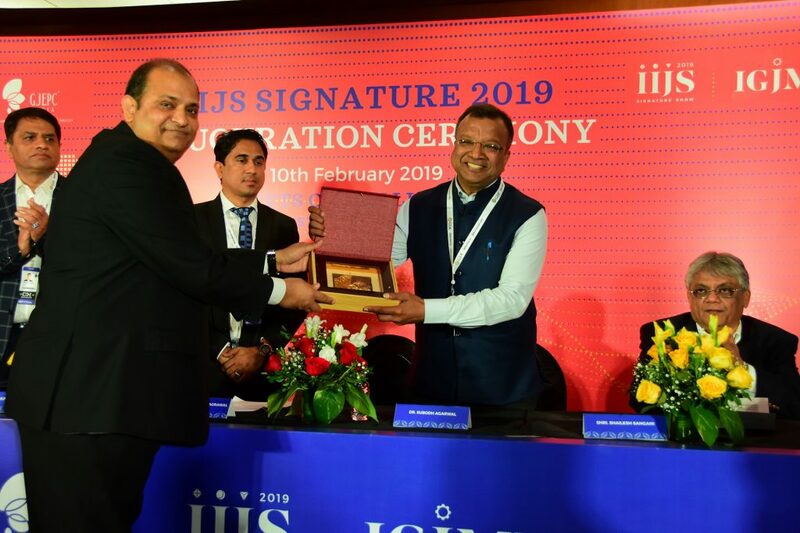 of Rajasthan) and Pramod Kumar Agrawal (Chairman, GJEPC) inaugurated IIJS Signature 2019 in the presence of Ashok Gajera (Regional Chairman, GJEPC), Shailesh Sangani (Convener, National Exhibitions Sub-Committee, GJEPC), Mansukh Kothari (Co-Convener Exhibitions & COA – Gold Jewellery, GJEPC), Mr. Kirit Bhansali (Co-Convener Exhibitions & COA-Diamond Panel, GJEPC) and Sabyasachi Ray (Executive Director, GJEPC). 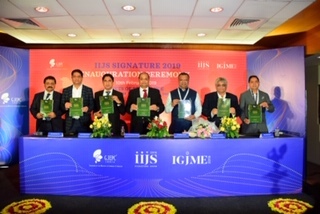 The distinguished dignitaries also unveiled the IIJS Signature 2019 and IGJME catalogue on the momentous occasion. IIJS Signature 2019 showcased the most coveted premium jewellery and flagged off the new buying season. The event hosts more than 750+ exhibitors and 1,400+ booths and is expected to attract 18,000 visitors from over 325+ cities and towns pan India and more than 55 countries globally. Buyer delegations are from countries such as the UK, UAE, Russia, Malaysia, Iran, Sri Lanka, Bangladesh, Nepal & Uzbekistan among others. Pramod Kumar Agrawal (Chairman, GJEPC) presents special memento to Dr. Subodh Kumar Agarwal (Addnl. Chief Secretary-Industry, Govt. of Rajasthan) at the inauguration of the Gem & Jewellery Export Promotion Council’s IIJS Signature 2019 at Bombay Exhibition Centre, Goregaon.